Get this popular season extender for only $69! Solar Harvest greenhouses are a great value for limited space! For under $700 you get sturdy frame, insulated covering, hinged door, and multiple vents. Extendable length. These portable greenhouses are simple and cost-effective solutions for temporary greenhouse needs. Our highest quality customizable home attached greenhouses. 100's of sizes and options available to match your existing home, shed, garage, or other structure. 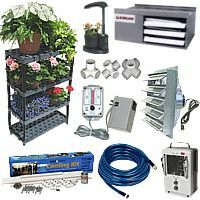 Ventilation Systems - Get the equipment you need to keep plants healthy and your greenhouse cool. Grow Lights - Grow plants indoors or provide plants in your greenhouse with additional lighting. Heaters - Choose from several electric and gas heaters ideal for any size greenhouse, garage, or shop. Misting Systems - Cool your greenhouse up to 20° F and control humidity with one of our misting systems. Benches - Maximize the space and plant capacity in your greenhouse with our exclusive line of Superior benches. ... and much more including shade covers, greenhouse controls, bubble insulation, and many other supplies. Not sure what to give the gardener in your family? Let them pick their own gift with an ACF Gift Certificate.